This article describes a method for tissue preparation of radical prostatectomy that allows the production of whole-mount sections and the collection of fresh tissues for research without the use of specialized equipment. Using this technique, the authors’ laboratory of 5 technicians can adequately process over 600 prostatectomies per year, admixed with an additional 5000 other surgical specimens. If fresh tissue is required for research purposes, the tissue may be harvested in the fashion described herein. The unfixed prostate gland is weighed and measured in 3 dimensions following removal of the left and right seminal vesicles. A horizontal section is cut through the gland, posterior to anterior, perpendicular to and through the prostatic urethra at about the level of the verumontanum (see the image below). A horizontal section is cut through the prostate gland from posterior to anterior, perpendicular to and through the prostatic urethra at about the level of the verumontanum (visible centrally). A hinge of tissue is left anteriorly. 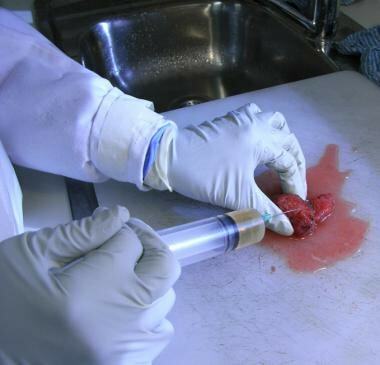 In this case, the tumor is macroscopically visible, allowing a fresh sample of malignant tissue to be harvested. A horizontal tissue section, 0.5-1mm thick, is taken from the cut surface. A hinge of tissue is left anteriorly. If the tumor is visualized macroscopically, this is helpful, and the tumor tissue can be targeted. In most cases, no tumor is visualized, and random sections of the posterior lobes and transition zone may be collected with particular reference to the preoperative needle biopsy results. Tissue is harvested by taking 0.5mm- to 1mm-thick horizontal tissue sections from the cut surface, as shown above, and immediately storing them at minus 80°C. Alternatively, samples may be taken from the cut surface by scraping cells with a surgical scalpel  or with punch biopsies. To avoid distortion of the specimen during fixation, the prostate gland is then reassembled using metal skin staples (see the image below). Careful attention must be paid to the capsule, whose cut surfaces are opposed and then stapled together. After fresh-tissue harvest, the prostate gland is reassembled and sutured using metal skin staples to avoid distortion of the specimen during fixation. Optimal fixation is critical for the histologic assessment of prostate cancer, and most artifacts related to the histologic or immunohistologic evaluation are a manifestation of poor tissue fixation. In the authors’ laboratory, a proprietary glutaraldehyde-based fixative (Solufix) is used, but in other laboratories, a high-quality formaldehyde or an alcoholic formaldehyde may provide suitable fixation. Because penetration to the center of the specimen is slow, particularly since cross-linking of proteins occurs during fixation of the prostatic capsule, an injection of fixative through the capsule is recommended. [6, 7] This is particularly important for glands larger than 30cc. The authors use an 18-gauge needle to inject the gland at multiple sites using a 10 or 20cc syringe (see the image below). The radical prostatectomy specimen is injected with fixative prior to immersion in fixative for 24 hours. Extreme care is required to avoid needle-stick injuries, and staff training is critical in avoiding such accidents. Wire-mesh gloves or tongs to support the tissue can be used. Following an injection of fixative, the prostate is then immersed in a bath of fixative and allowed to fix for 24 hours at room temperature. 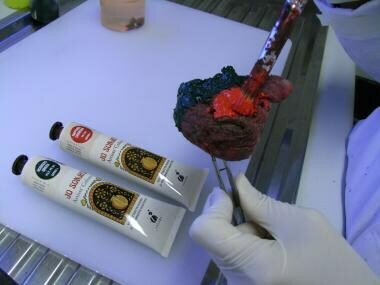 After removal from the fixative solution, the specimen is dried, and the left and right lobes are painted with different colors using an acrylic-based paint (see the image below) to orient the gland and to clearly delineate the surgical margins. Many different colors of acrylic paint are available at most artist shops, but care must be taken in the selection of brands whose pigment is xylene fast. Following fixation, the left and right lobes of the prostate are painted with different colors using xylene-insoluble, acrylic-based paint to orient the gland. After the gland is painted, the prostate is dried with a household hairdryer until the acrylic paint is solid. Once dry, the prostate can be sectioned (see Tissue Sectioning and Embedding). The prostatic apex is separated from the gland approximately 2mm from the apical surface. To enhance the detection of the apical surgical margins, the apical portion is then bread-loafed from the left to the right in 3mm slices, and the left and right apical tissues are placed in separate cassettes. In a similar fashion, the bladder neck (base) is cut, sectioned perpendicularly, and stored in separate cassettes. The seminal vesicles are sectioned vertically, and a single section from base to tip of each seminal vesicle is blocked (1 or 2 cassettes). The remainder of the gland is cut in a stepwise fashion. The authors’ laboratory uses a standard cutting board on which 2 glass rods (4mm in diameter) are stuck with epoxy resin. The prostate gland is placed between the rods that are used to guide a standard laboratory disposable blade, allowing whole-mount sections to be cut at exactly 4mm intervals. 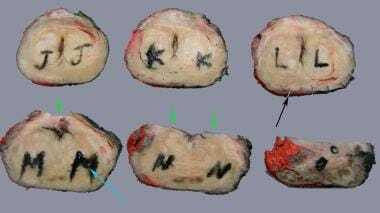 Once sectioned, the prostate slices are labeled with India ink in alphabetical order (eg, A, B, C) to orientate them with respect to the superior and inferior surfaces plus the anterior and posterior margins (see the image below); they are then refixed for another 6 hours. These 4mm whole-mount sections are then divided into halves (or quadrants, in a large gland) to fit into standard-size cassettes used for paraffin-embedding. Careful labeling is critical to allow the technicians to correctly orient the sections. The 4mm prostate slices are labeled in alphabetical order with India ink (blue arrow); in this way, they can be oriented with respect to the superior and inferior surfaces, as well as the anterior and posterior margins. The black arrow shows the metal skin staples that were used to reassemble the prostate after fresh-tissue harvest. The anterior surgical margin is deficient (green arrows), as this margin is represented in the separately sampled bladder neck. Sections are cut and placed on large glass slides, with care taken to oppose the left and right sections such that they appear as a single whole-mount section. Standard hematoxylin and eosin (H&E) stains are performed on all whole-mount sections, all apical and bladder neck sections, and the single embedded sections from each seminal vesicle. Immunostains are generally not required for standard, routine histologic interpretation. While these parameters can be adequately assessed using a systematic partial submission strategy, embedding of the entire gland and use of whole-mount sections allow an evaluation of potential new prognostic factors. These factors include those currently listed as category 2 (supported in the literature but requiring further validation in larger, multivariate studies), such as tumor volume, [12, 13] or category 3 (relatively or completely untested), such as the zonal origin of the tumor (peripheral, transition, or central zone) [14, 15] and tumor multifocality. Cutting the entire gland into 4mm slices and reorienting the tissue sections to reconstruct each whole-mount slice allow a simple calculation of tumor volume. The areas of cancer on each section are colored under low power (X15) using a fine, indelible, felt-tip marker pen. A scanned image of the tissue sections is obtained (see the image below), and a computerized image analysis is used to calculate the overall area in cubed centimeters of cancer on each section. A scanned image of prostate sections from apex to base. Tissue sections from the left and right lobes are mounted together on large glass slides so that they appear as a single whole-mount section. Areas of tumor are colored with a fine, indelible, felt-tip marker pen to allow calculation of the tumor volume. 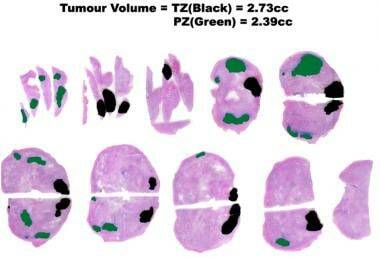 Different colors can be used to identify separate tumors arising from the different prostatic zones, in this case the peripheral zone (PZ) and the transition zone (TZ). Occasionally, and despite an accurate preoperative diagnosis, prostatic adenocarcinoma is not identified. A review of preoperative core biopsies is indicated to confirm the diagnosis. levels may be cut through blocks in areas of high-grade dysplasia (eg, prostatic intraepithelial neoplasia, or PIN) if clinically indicated. The absence of carcinoma following microscopic carcinoma on core biopsy is well described, [17, 18] and no further laboratory action is necessary. The technique described herein provides a simple, cost-effective method of allowing whole-mount examination of the prostate gland. Using this technique allows the authors to easily process 3-4 specimens daily as part of a busy tissue pathology laboratory without resorting to any specialized or expensive equipment. The entire gland is examined in each case with good orientation and the opportunity to collect fresh tissue if desired without impact on the quality of the sections. Bertilsson H, Angelsen A, Viset T, Skogseth H, Tessem MB, Halgunset J. A new method to provide a fresh frozen prostate slice suitable for gene expression study and MR spectroscopy. Prostate. 2011 Apr. 71(5):461-9. [Medline]. Samaratunga H, Montironi R, True L, et al for the ISUP Prostate Cancer Group. International Society of Urological Pathology (ISUP) Consensus Conference on Handling and Staging of Radical Prostatectomy Specimens. Working group 1: specimen handling. Mod Pathol. 2011 Jan. 24(1):6-15. [Medline]. Vainer B, Toft BG, Olsen KE, Jacobsen GK, Marcussen N. Handling of radical prostatectomy specimens: total or partial embedding?. Histopathology. 2011 Jan. 58(2):211-6. [Medline]. Sakr WA, Grignon DJ, Visscher DW, et al. Evaluating the radical prostatectomy specimen, part 1. J Urol Pathol. 1995. 3:355-64. Wheeler TM, Lebovitz RM. Fresh tissue harvest for research from prostatectomy specimens. Prostate. 1994 Nov. 25(5):274-9. [Medline]. Hoedemaeker RF, Ruijter ETG, Riuzeveld-de Winter JA, et al. Processing radical prostatectomy specimens: a comprehensive and standardized protocol. J Urol Pathol. 1998. 9:211-22. Ruijter ET, Miller GJ, Aalders TW, et al. Rapid microwave-stimulated fixation of entire prostatectomy specimens. Biomed-II MPC Study Group. J Pathol. 1997 Nov. 183(3):369-75. [Medline]. Stamey TA, McNeal JE, Freiha FS, Redwine E. Morphometric and clinical studies on 68 consecutive radical prostatectomies. J Urol. 1988 Jun. 139(6):1235-41. [Medline]. [Guideline] Hammond ME, Fitzgibbons PL, Compton CC. College of American Pathologists Conference XXXV: Solid Tumor Prognostic Factors—Which, How and So What? Summary Document and Recommendations for Implementation. College of American Pathologists Conference XXXV, June 10–13, 1999. [Full Text]. Srigley JR. Key issues in handling and reporting radical prostatectomy specimens. Arch Pathol Lab Med. 2006 Mar. 130(3):303-17. [Medline]. Epstein JI, Feng Z, Trock BJ, Pierorazio PM. Upgrading and downgrading of prostate cancer from biopsy to radical prostatectomy: incidence and predictive factors using the modified Gleason grading system and factoring in tertiary grades. Eur Urol. 2012 May. 61(5):1019-24. [Medline]. Stamey TA, McNeal JE, Yemoto CM, Sigal BM, Johnstone IM. Biological determinants of cancer progression in men with prostate cancer. JAMA. 1999 Apr 21. 281(15):1395-400. [Medline]. Merrill MM, Lane BR, Reuther AM, Zhou M, Magi-Galluzzi C, Klein EA. Tumor volume does not predict for biochemical recurrence after radical prostatectomy in patients with surgical Gleason score 6 or less prostate cancer. Urology. 2007 Aug. 70(2):294-8. [Medline]. Chun FK, Briganti A, Jeldres C, et al. Zonal origin of localized prostate cancer does not affect the rate of biochemical recurrence after radical prostatectomy. Eur Urol. 2007 Apr. 51(4):949-55; discussion 955. [Medline]. Cohen RJ, Shannon BA, Phillips M, Moorin RE, Wheeler TM, Garrett KL. Central zone carcinoma of the prostate gland: a distinct tumor type with poor prognostic features. J Urol. 2008 May. 179(5):1762-7; discussion 1767. [Medline]. Cohen RJ, Chan WC, Edgar SG, et al. Prediction of pathological stage and clinical outcome in prostate cancer: an improved pre-operative model incorporating biopsy-determined intraductal carcinoma. Br J Urol. 1998 Mar. 81(3):413-8. [Medline]. Cao D, Hafez M, Berg K, Murphy K, Epstein JI. Little or no residual prostate cancer at radical prostatectomy: vanishing cancer or switched specimen? : a microsatellite analysis of specimen identity. Am J Surg Pathol. 2005 Apr. 29(4):467-73. [Medline]. Trpkov K, Gao Y, Hay R, Yimaz A. No residual cancer on radical prostatectomy after positive 10-core biopsy: incidence, biopsy findings, and DNA specimen identity analysis. Arch Pathol Lab Med. 2006 Jun. 130(6):811-6. [Medline].